Taylored Expressions New Release and a Video! Its release day at Taylored Expressions! Hooray! All the thirteen new Stamp and Die combo, seven dies and three new embossing flowers are released today. These stamp set and die are perfect for the budget at this time of the year. I love them all especially the Stamp and Die combo sets. 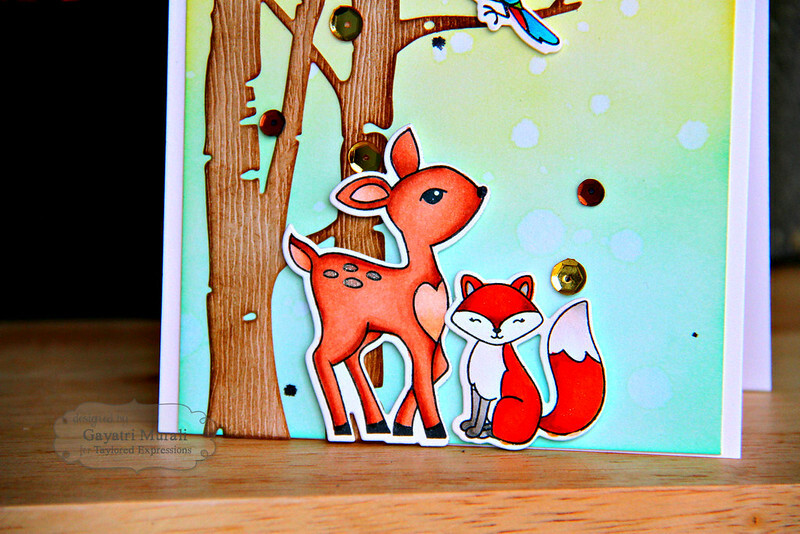 I am showcasing the new Forest Friends stamp and die combo today. I have couple of cards and a video of one the cards to share with you today. My first card showcases one of the animals from Forest Friend stamp and die combo along with Let’s Talk Edger 2 die. 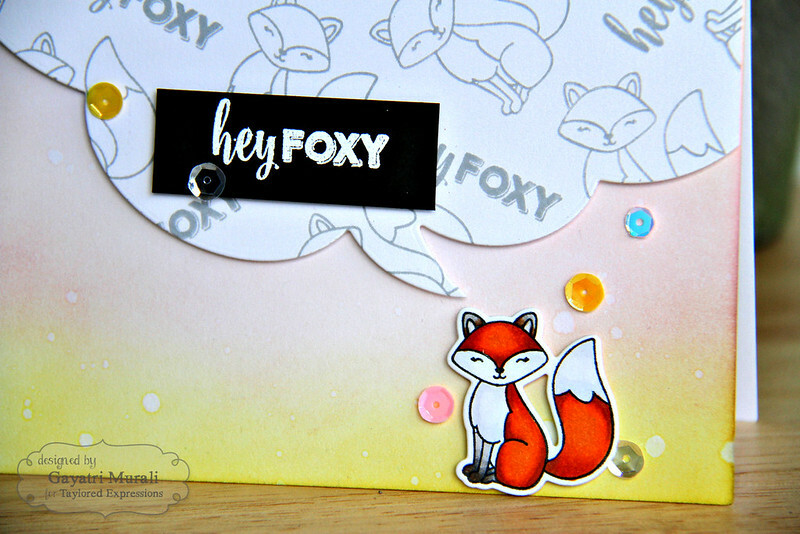 I stamped the fox image and “Hey Foxy” sentiment from the set randomly all over a white panel with gray ink. Then I used the Let’s Talk Edger die to die cut. On the white card base, I sponged Squeezed Lemonade, Victorian Velvet and Spun Sugar distress ink on the bottom of the card front. I spattered some water. Then I adhered the Let’s Talk Edger die cut on top of the card front using foam for dimension. 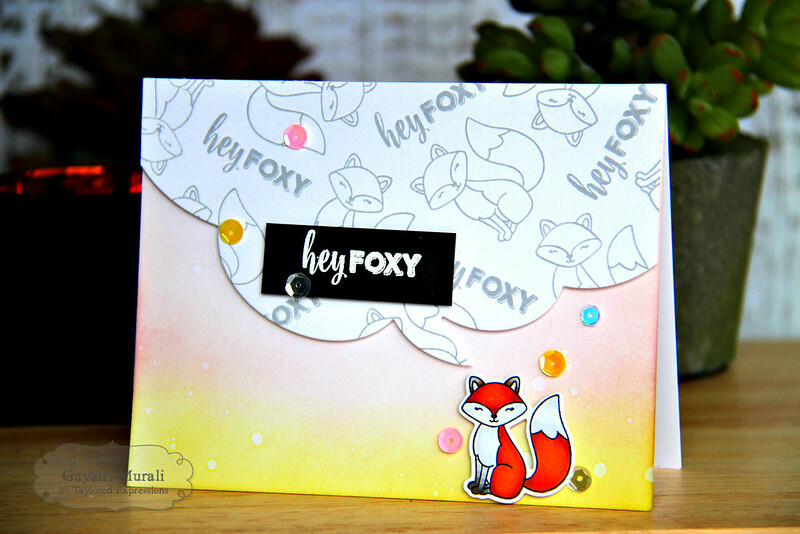 I stamped, copic coloured and die cut the fox image from Forest Friend stamp set. 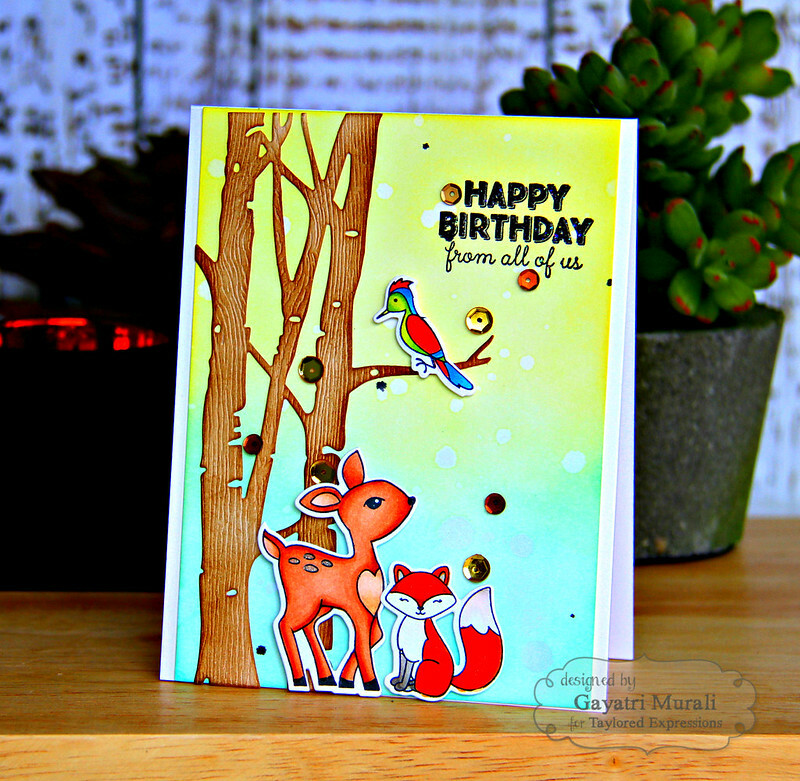 I adhered the fox on the bottom of the card front as shown. The sentiment is white heat embossed on black cardstock , trimmed and adhered using foam adhesives. Finally used sequins from Rainbow Bright and Halloween from Taylored Expressions to bring the card together. Here is a closeup. 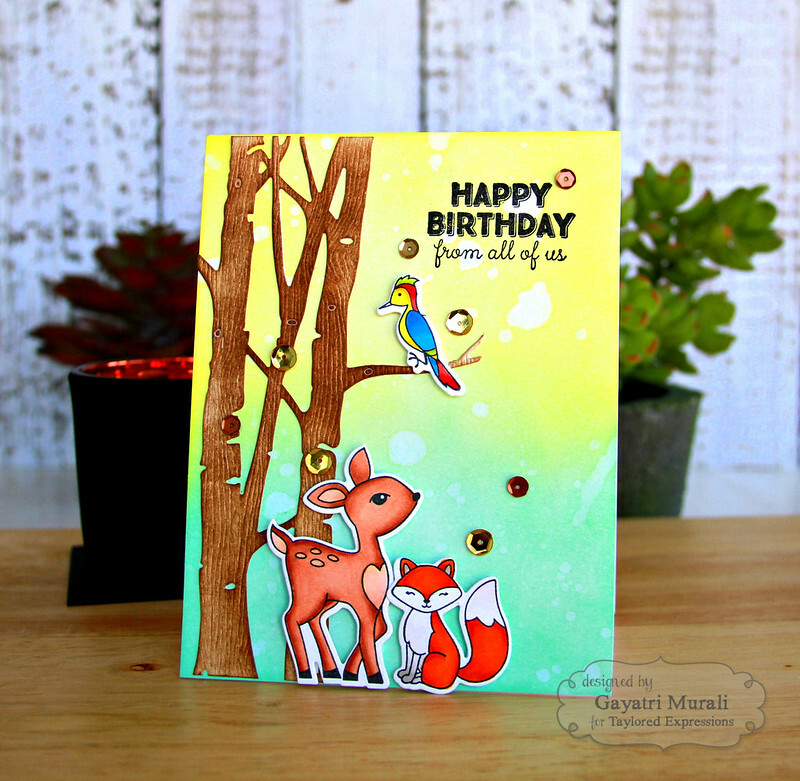 My second card is different and it uses all the three animal images from Forest Friend Stamp and Die combo along with Taylored Expressions Birch Tree Border die. This border die coordinates well with the stamp set. 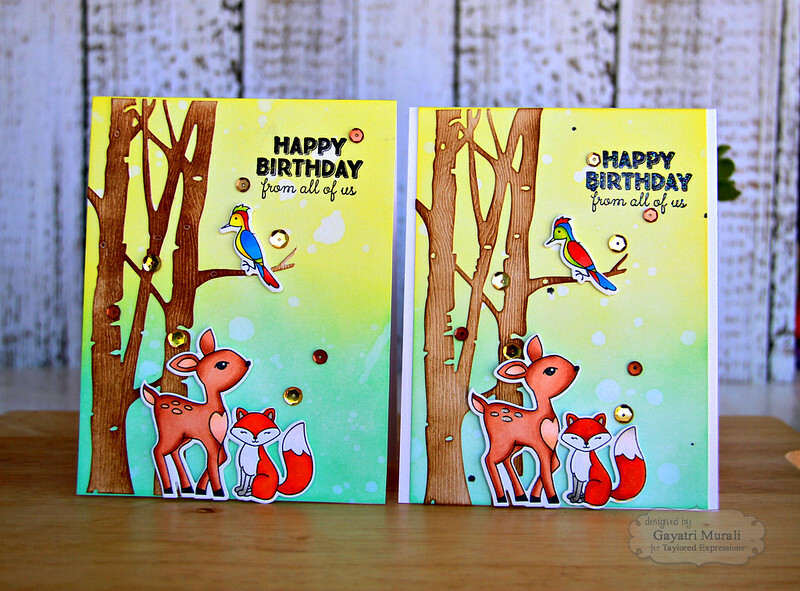 I simply stamped, copic coloured and die cut the deer, fox and bird images from Forest Friend stamp and die combo. I then die cut the birch tree using the Birch Tree Border die using woodgrain cardstock. I then sponged Gathered Twigs and Vintage Photo distress inks on the birch tree die cut. On a white card panel, I sponged Cracked Pistachio and Crushed Olive distress inks, spattered clean water. I adhered the birch tree on the left side of the panel. Then the deer and fox towards the bottom of the panel using foam adhesives. Then I black heat embossed the sentiment on the top right of the panel. Finally the bird on the branch using foam adhesive. This panel is adhered on a white card base. Embellished with sequins from Taylored Expression Wedding collection. Hope you like my video. If you do please give me a thumbs up on my You Tube Channel. Here is the second card I made in the video. And both the cards together. Hope you enjoyed my projects today. All the new stamp and die combos, dies and embossing folders are now available for purchase from Taylored Expressions Shop. Check out Taylored Expressions Blog for more inspirations from talented design team members. Great coloring and shading. The large thought bubble is fantastic! All three cards are terrific. Your blending and coloring are outstanding. Hello! 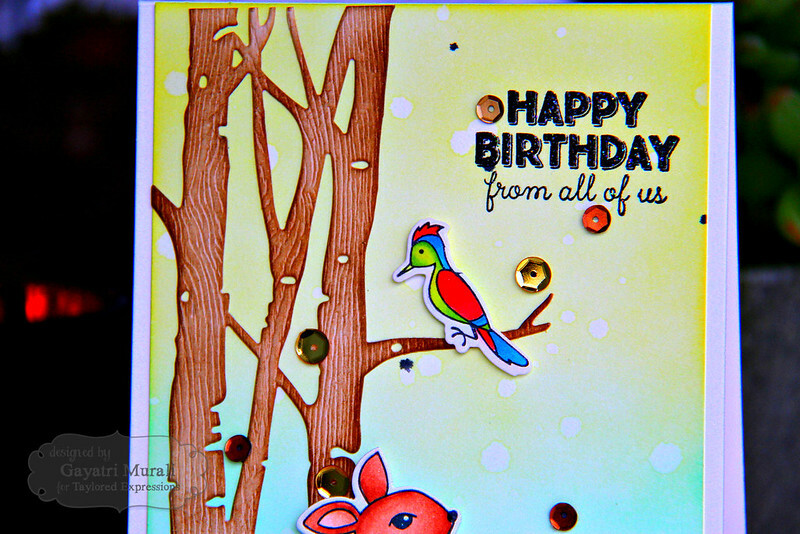 You make wonderful cards =) Have you ever thought about making your own website, not on blogspot? Gayatri, love the ink blending you did. I need to take them out more. Cute cards.